After a long five-year wait, Canon finally launched an update to their flagship APS-C DSLR at the end of 2014 in the shape of the EOS 7D Mark II. Despite only a modest increase in sensor resolution (up to 20Mp from 18Mp), a raft of other features adopted from their pro DSLRs made it look like an interesting proposition. 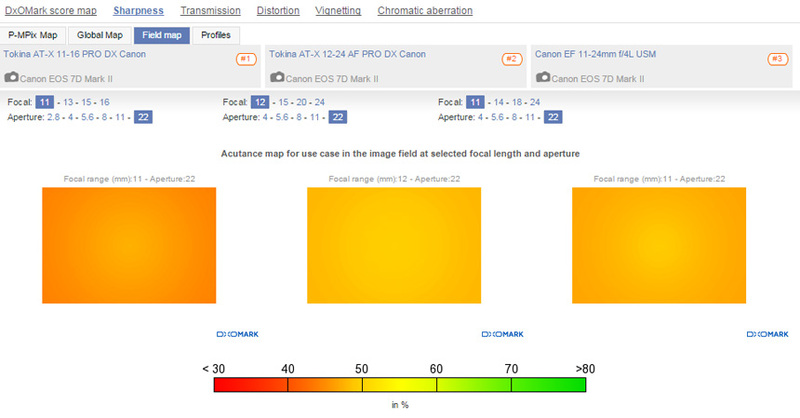 Foremost of these was the new 65-point AF system, with Dual Pixel AF technology for phase-detection AF during video capture, almost 80% AF frame coverage, and AF controls similar to Canon’s pro EOS 5D Mark II and 1Dx cameras. Add to that 100% viewfinder coverage, burst shooting at 10fps, a three-inch 1.04m-dot LCD screen, and a whole host of advanced video options including 50/60fps capture and mini-HDMI output, and the EOS 7D Mark II started to look like a decent upgrade. 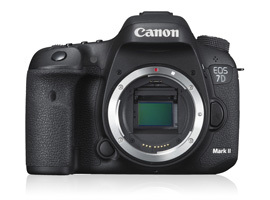 Having undergone the rigors of DxOMark lab tests, however, the EOS 7D Mark II’s scores underwhelmed a little, with an overall score of 70 points, ranking it well down the performance spectrum. Read the full review HERE. 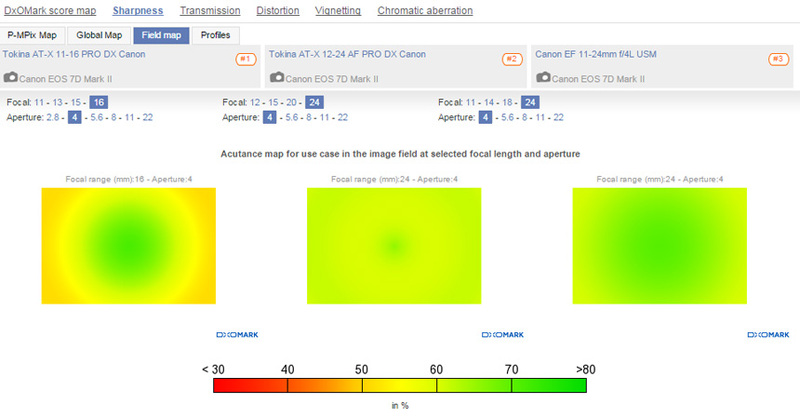 Sensor performance is only half of the equation, however, with lens quality having an important impact on image quality. 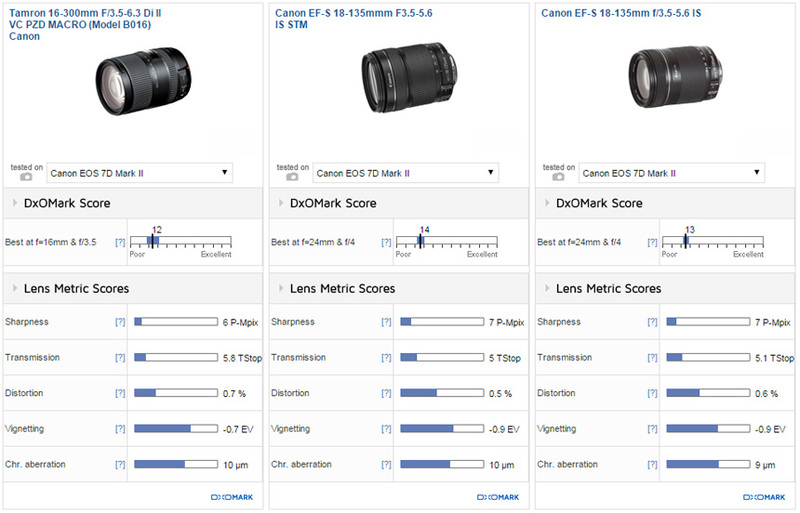 We’ve analyzed a huge range of own-brand Canon EF and EF-S glass, as well as third-party options, to see which lenses perform best on the EOS 7D Mark II. So whether you’re after an affordable and convenient super-zoom lens for holidays and day trips, a high-quality standard zoom for everyday use, or the best telephoto money can buy, we’ve got all the information you need. In this part of our best lenses review, we kick off with zoom lenses and bring you the top three zooms across five categories: ultra-wide-angle, standard zoom, super-zoom, “fast” telephoto, and “slow” telephoto. 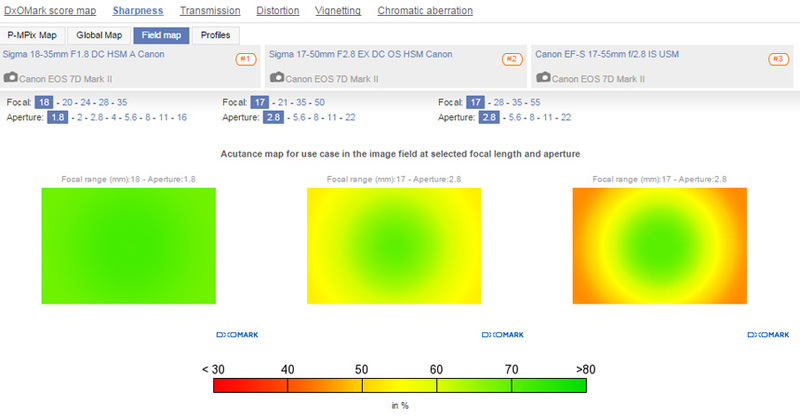 An ultra-wide-angle lens is defined as having a focal length of 20mm or less, and lenses designed for APS-C cameras can go as wide as 8mm or 10mm. Ultra-wides are an important lens for architecture and landscape photography, particularly in locations where space is restricted, as the ultra-wide field of view ensures you can fit everything in. Rectilinear ultra-wide-angle lenses also keep lines straight so images don’t suffer distortion as they do with fisheye lenses, making them particularly useful for professionals. Ultra-wides can also be used creatively for more dynamic images, as they exaggerate the space between the near and the far. This makes them popular with landscape photographers who want to emphasize something in the foreground to make it look big and dominating. This effect can also work well for a range of other subjects, such as portraiture or product photography, with other unusual and dramatic effects possible using an ultra-wide. We’ve analyzed images using 11 ultra-wide-angle zoom lenses on the Canon EOS 7D Mark II, and scores range from a low of 9 for the Sigma 12-24mm f/4.5-5.6 EX DG to a high of 16 for the Tokina AT-X 12-24mm f/4 AF PRO DX. With the top three lenses achieving an overall DxOMark score of 16 points, it’s effectively a three-way tie for the best ultra-wide-angle lens on the EOS 7D Mark II. Both the Tokina 11-16mm and the Canon EF 11-24mm offer that extra field of view at the wide end of the focal range, but if a fast f/2.8 aperture is more important for you, then the Tokina 11-16mm is the one to go for. All three lenses score 9 P-Mpix for the Sharpness lens metric,and there’s really nothing in it between them in this regard. The Tokina 12-24mm is marginally sharper and more homogenous at 11mm at all aperture settings compared to the 11mm competition. At the widest focal length and minimum aperture setting of f/22, none of the lenses are super sharp, but again the Tokina 12-24mm is just ahead. At 24mm, the EF 11-24mm just has the edge over the Tokina 12-24mm at all aperture settings, but there’s not much in it, which makes the Tokina lenses look like a much better value for the money compared to the $2,999 Canon EF 11-24mm. The Tokina 11-16mm also features better light Transmission for the brightest viewfinder, but has the worst Distortion of the three lenses. As you’d expect, all lenses barrel at their widest focal length setting, but the Tokina 11-16mm continues to display barrelling right through to 16mm, which is disappointing. 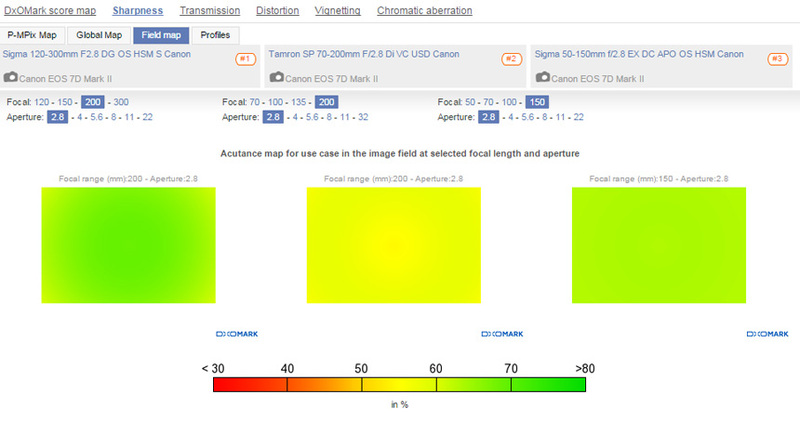 For Vignetting and Chromatic Aberration, there’s not much in it and all lenses will require some correction in post-production for these optical flaws. A standard zoom offers a versatile focal length from wide-angle through to short telephoto. This makes them a convenient choice for travel and day trips, as well as for general use photography, when you want to snap a variety of subjects without changing lens. “Fast” standard zoom lenses with a maximum aperture of f/1.8 or f/2.8 are also helpful for shooting in low light, or for throwing a background out of focus. 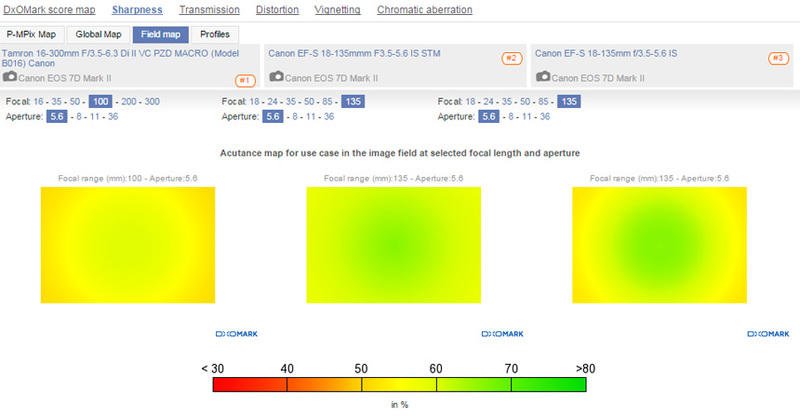 Covering a diverse focal range with a “fast” aperture requires some chunky glass, though, so standard zooms aren’t the smallest or lightest optics available. On a large APS-C camera such as the EOS 7D Mark II, the balance between camera and lens is fine, but on smaller entry-level cameras this set up is going to be pretty front-heavy. 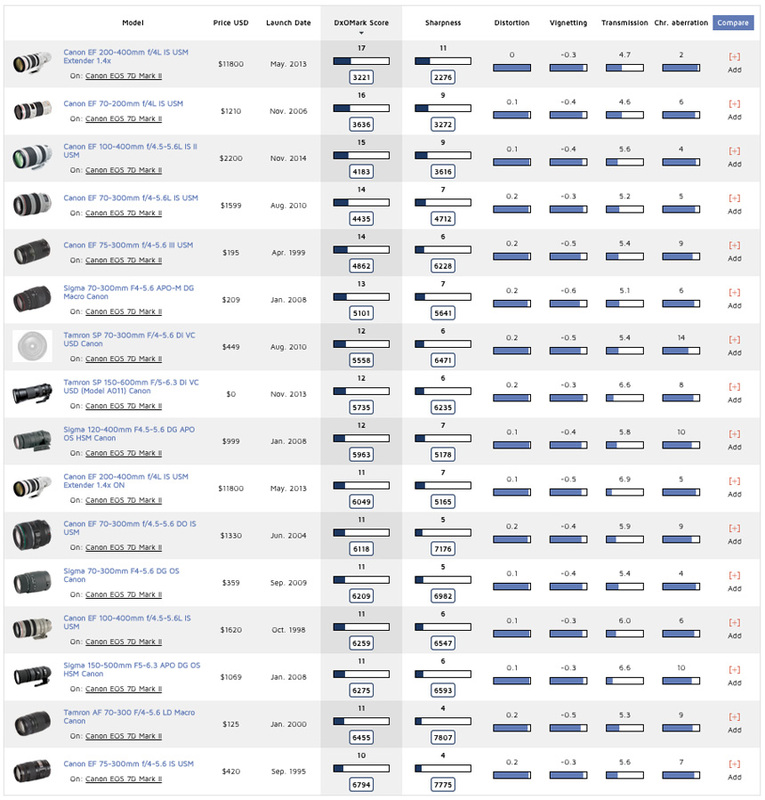 We’ve tested 18 standard zoom lenses on the Canon EOS 7D Mark II and scores range from a low of 11 points for the Sigma 17-35mm f/2.8-4 EX DG Aspherical HSM to a high of 27 points for the Sigma 18-35mm f/1.8 DC HSM A. A new lens in Sigma’s “Art” range of creative optics, the Sigma 18-35mm f/1.8 DC HSM A is a little different compared to most standard zooms. 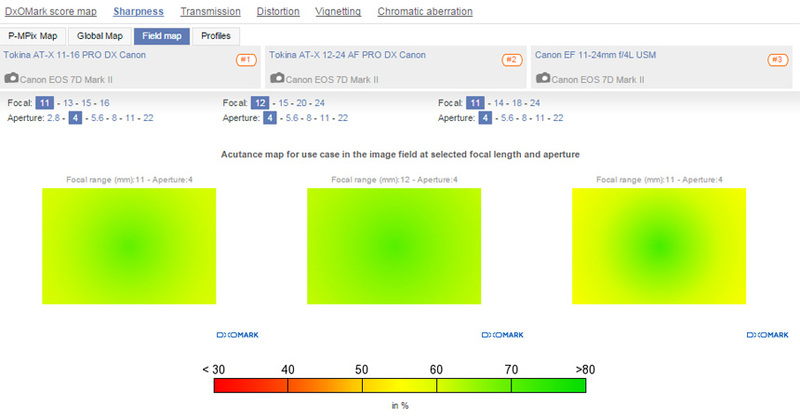 Boasting a maximum aperture of f/1.8, it’s a stop faster, but with a more limited focal range that maxes out at 35mm. In equivalent full-frame terms, 35mm equates to 56mm on Canon APS-C sensors, so the Sigma 18-35mm will just about get you into the realms of portraiture, but it’s not as versatile a focal range for general use photography. The advantage of the shorter focal range and wider aperture becomes clear in the scores, however, with the Sigma 18-35mm f/1.8 far ahead for the lens metrics of Sharpness and Transmission. With almost two stops’ better light transmission than the Canon EF 17-55mm, the Sigma 18-35mm f/1.8 offers a brighter, more usable viewfinder image and the possibility of faster shutter speeds when shooting in low light. Overall Sharpness on the Sigma 18-35mm f/1.8 is far ahead, too, with good resolution at the max aperture of f/1.8 all through the focal range. At 35mm, f/1.8 the corners do just drop off slightly, but stop down to f/2.8 and the Sigma 18-35mm f/1.8 offers outstanding sharpness through to f/5.6. 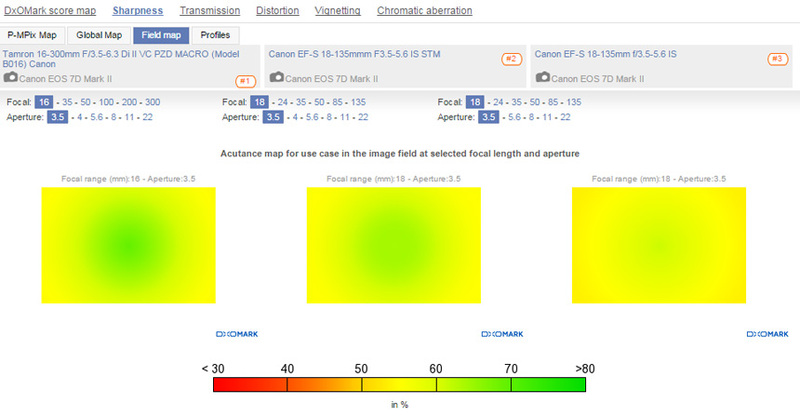 It’s not quite as sharp between f/8 – f/16, but resolution is still homogenous into the corners. 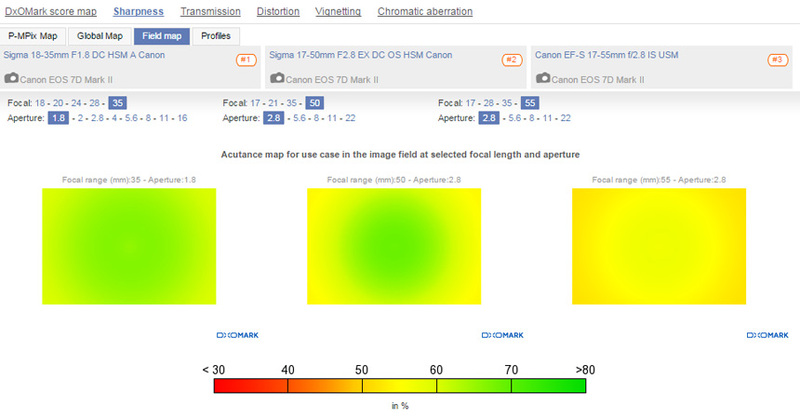 In comparison, the Sigma 17-50mm and the Canon 17-55mm don’t really offer homogenous sharpness at any focal lengths using the maximum f/2.8 aperture, with both lenses needing to be stopped down to f/5.6 to achieve a resolution that even approaches the Sigma 18-35mm at f/1.8. 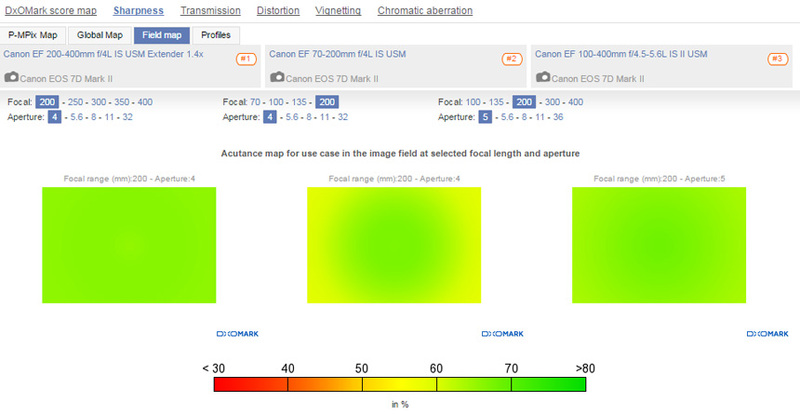 Super-zooms offer a large focal range from wide-angle through to long telephoto and often cover over a 10x zoom range. An even more versatile optic with extra reach can make super-zoom a more attractive option for general use, photography vacations, and day trips than a standard zoom. 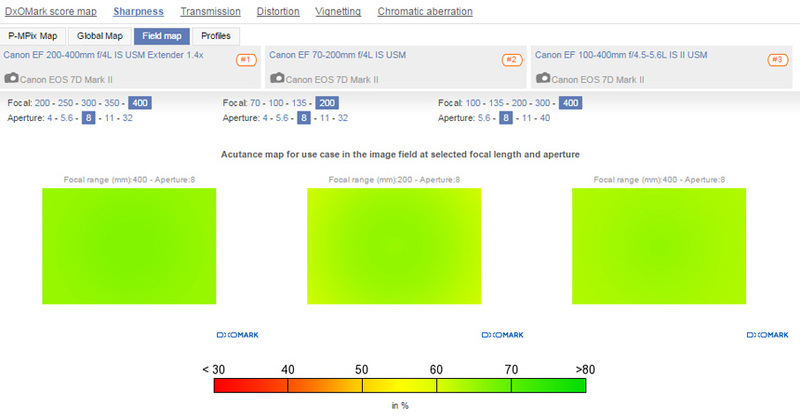 Although convenient, super-zooms aren’t as strong optically as zooms covering a shorter focal length, and this is reflected in their DxOMark scores. To keep them affordable, as well as practical in terms of size and weight, super-zoom lenses also use a “slow” variable maximum aperture, such as f/3.5 – f/5.6. Light transmission on a super-zoom is relatively poor, too, so overall they’re a bit more challenging to use in low light. If you do shoot in low light, look out for a super-zoom featuring Image Stabilization, which can help make it possible to use slower shutter speeds without images suffering from camera shake. If you’re planning to shoot sports or wildlife with a super zoom, however, you’re going to need pretty good light to achieve fast enough shutter speeds to freeze the motion. 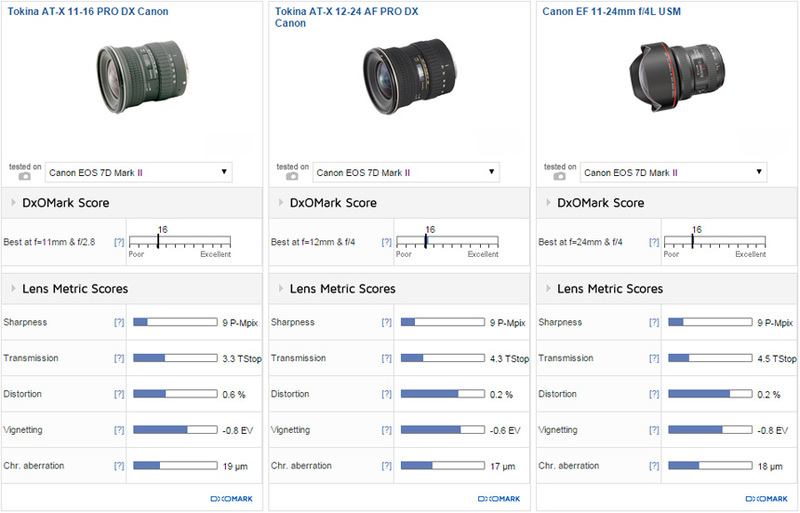 We’ve tested 13 super-zooms on the EOS 7D Mark II, with scores ranging from a low of 9 points for the Tamron AF 18-250mm f/3.5-6.3 Di II LD Aspherical (IF) Macro, to a high of 14 points for the Canon EF-S 18-135mm f/3.5-5.6 IS STM. The Canon 18-135mm zooms offer an equivalent to 29–216mm in full-frame terms, covering wide-angle through to long telephoto focal range. The Tamron 16-300mm, on the other hand, covers a massive 18x zoom range, equivalent to 26–480mm, from wide-angle through to super-telephoto focal range, for photographers looking to get even closer to the action. With that extra reach, the Tamron 16-300mm can offer only a slightly “slower” aperture of f/6.3 at 300mm, and at 540g, it’s a little heavier than the 480g Canon EF-S 18-135mm. 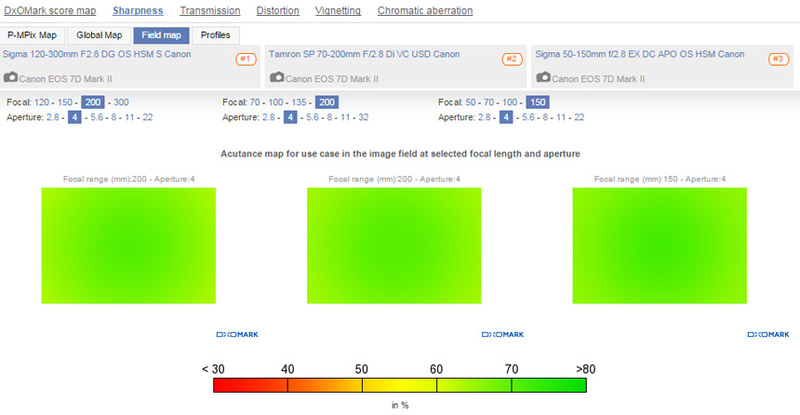 Despite their differences in focal length, however, their DxOMark Scores are pretty close, and there’s not much between these three lenses for Distortion, Vignetting, or Chromatic Aberration. With the extra glass required to enable the longer zoom, the Tamron 16-300mm has the worst light Transmission of the three, with both Canon 18-135mm options boasting around a two-thirds stop brighter viewfinder. 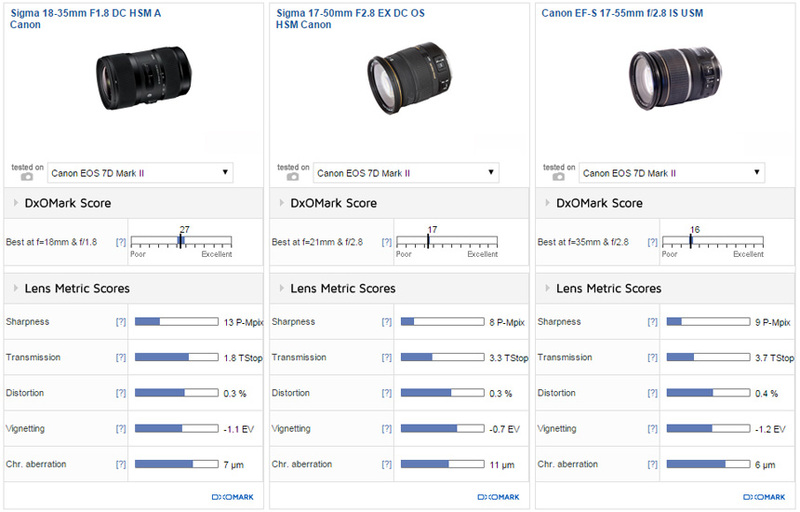 Sharpness scores are also pretty close, but at 6 and 7 P-Mpix, all three lenses chart towards the lower end of the performance spectrum. That means they don’t offer good edge-to-edge sharpness at any setting, which is the trade-off you pay for a lightweight, convenient lens. Canon’s newer version of the 18-135mm, featuring their STM autofocus motor for video, offers slightly improved sharpness over the older non-STM version, however. At the widest focal length and aperture of f/3.5, the Tamron 16-300mm and Canon 18-135mm STM offer better sharpness in the center than the non-STM version. At 135mm using the maximum f/5.6 aperture, the newer Canon 18-135mm STM version wins again, and Canon has obviously focused on performance at the telephoto end, with a notable improvement in edge sharpness over its predecessor. At the longest 300mm focal length on the Tamron 16-300mm using the widest f/6.3 aperture setting, sharpness suffers both in the center and markedly towards the edges of the frame. Typically covering a focal range around 70-200mm, “fast” telephoto zoom lenses offer a fixed f/2.8 maximum aperture throughout the focal range. Achieving this optically means these fast telephoto zooms are significantly bigger, heavier and more expensive than their variable-aperture equivalents, however. That puts them squarely in the serious enthusiast or pro category, but for many of these photographers, a fast telephoto zoom is one of their most important lenses. Ideal for a range of subjects such as sports, wildlife, events, and portrait photography, the f/2.8 aperture makes fast shutter speeds achievable in poor light and helps create defocused backgrounds, too. We’ve tested ten fast telephoto lenses on the EOS 7D Mark II and scores range from a low of 14 points with the Canon EF 70-200mm f/2.8L IS USM to a high of 22 points with the Sigma 120-300mm f/2.8 DG OS HSM. Our top three lenses in this category offer a range of different focal lengths, so the most suitable will really depend on what you plan to use it for. Sigma’s dedicated crop sensor 50-150mm f/2.8 offers an equivalent 80–240mm focal range on an APS-C, making it the closest to the traditional 70-200mm lens and arguably the most versatile of the three. Sigma’s 120-300mm f/2.8 and Tamron’s 70-200mm f/2.8, on the other hand, are really designed more for full-frame DSLRs, but are still compatible with APS-C sensors, on which they provide greater reach. Sigma’s 120-300mm equates to a massive 200–500mm equivalent focal length, which is going to be on the long side for most photography, but perfect on APS-C sensors for wildlife and lots of sports, such motor racing. Tamron’s 70-200mm is going to be a little more practical, not to mention affordable, with its 112–320mm equivalent focal length opening up some possibilities for portraiture and events on the EOS 7D Mark II, as well as for sports and wildlife. 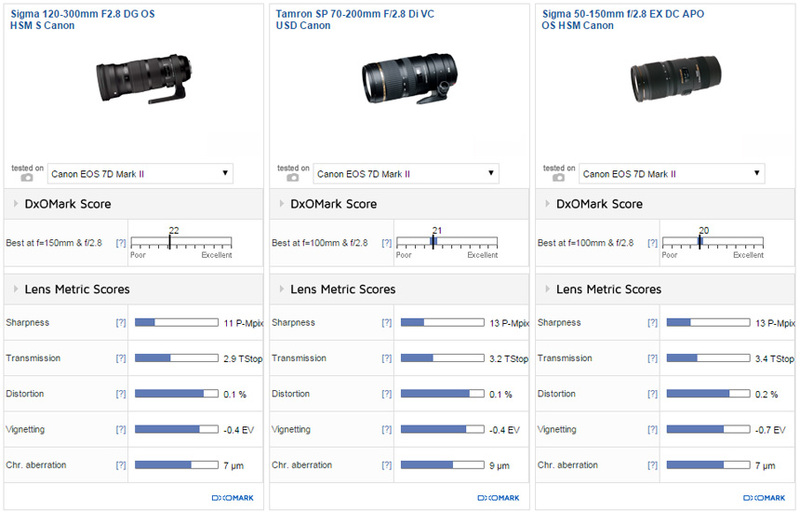 With either equal or top scores in all lens metrics except Sharpness, the Sigma 120-300mm f/2.8 just gets the nod overall with a DxOMark score of 22 points. 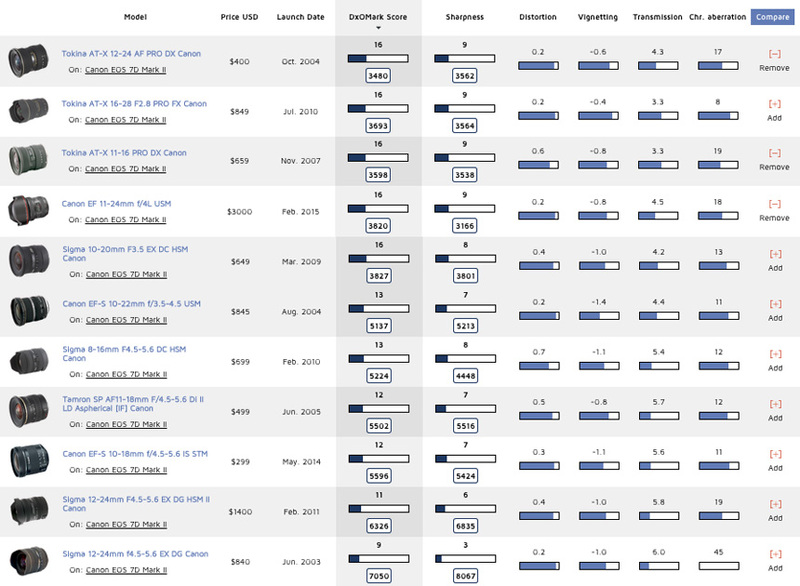 It posts a lower Sharpness score of 11 P-Mpix, compared to 13 P-Mpix for both 70-200mm and 50–150mm competitors, however. At max f/2.8 aperture, sharpness on the 120-300mm isn’t truly homogenous at any focal length, although it’s marginally better in the middle of the focal range around 200mm. It’s very respectable in the center, however, and stopping down to f/4 improves edge sharpness notably, with the 120-300mm performing best between f/4 – f/8. The Sigma 50-150mm is also at its sharpest between f/4 – f/8, and at f/2.8 it resolves best in the middle of its focal range, with excellent sharpness at 100mm. At 150mm, the Sigma 50-150mm is a little softer, but it’s still homogenous, which is a plus. In terms of edge sharpness, the Tamron 70-200mm is the most consistent at f/2.8 throughout the focal range, but it is noticeably softer overall at 200mm compared to 135mm, which is worth knowing if you plan to shoot a lot at the long end of the focal range. “Slow” telephoto zooms are a cheaper alternative for photographers who want to zoom into the action but can’t afford the “fast” aperture f/2.8 models. 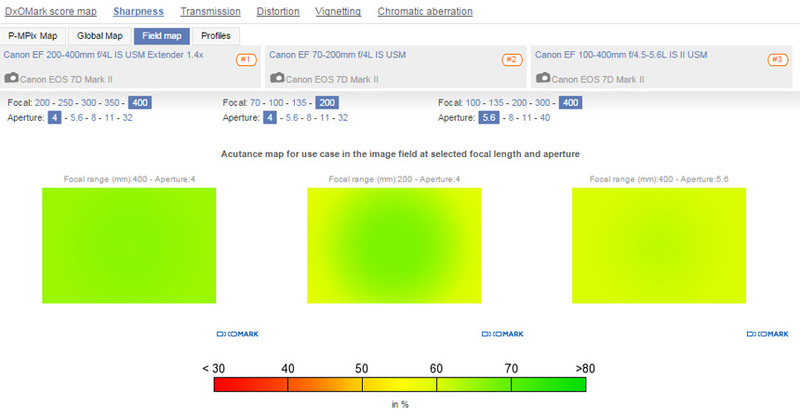 Variable-aperture lenses such as the Canon EF 100-400mm f/4.5-5.6L IS II USM are available in this category, but Canon also produces a range of fixed-aperture f/4 telephoto zooms. For many enthusiast photographers, a f/4 telephoto zoom is a good compromise between size, weight, and price. For example, the 705g / $1199 Canon EF 70-200mm f/4L IS USM is less than half the weight and almost half the price of the f/2.8L IS II USM version. 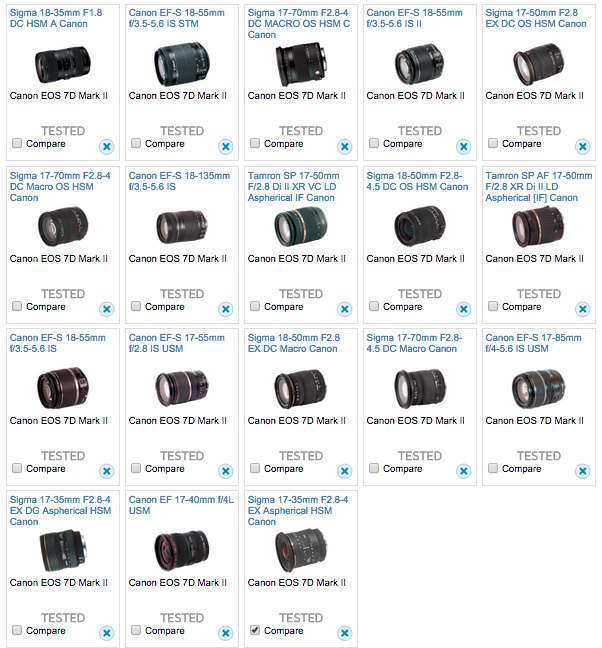 We’ve tested 16 “slow” telephoto zoom lenses on the EOS 7D Mark II. 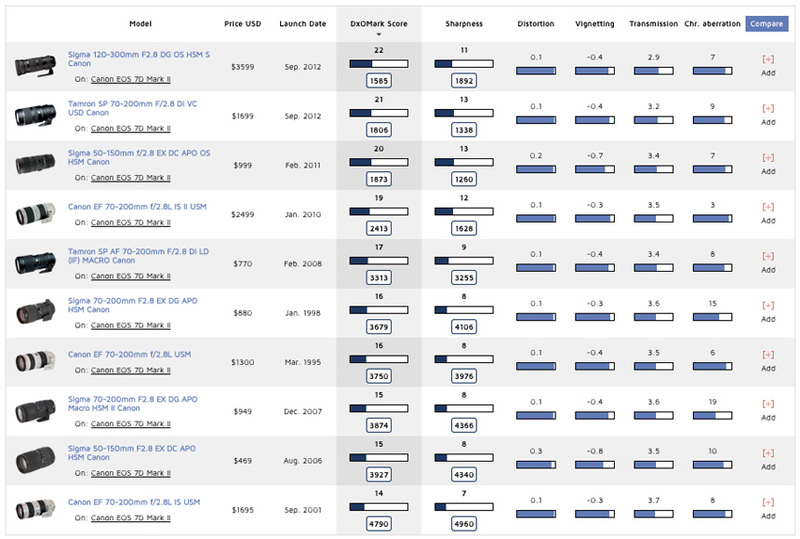 Scores range from a low of 10 points for the Canon EF 75-300mm f/4-5.6 IS USM to a high of 17 points on the very expensive specialist Canon EF 200-400 f/4L IS USM Extender 1.4x. 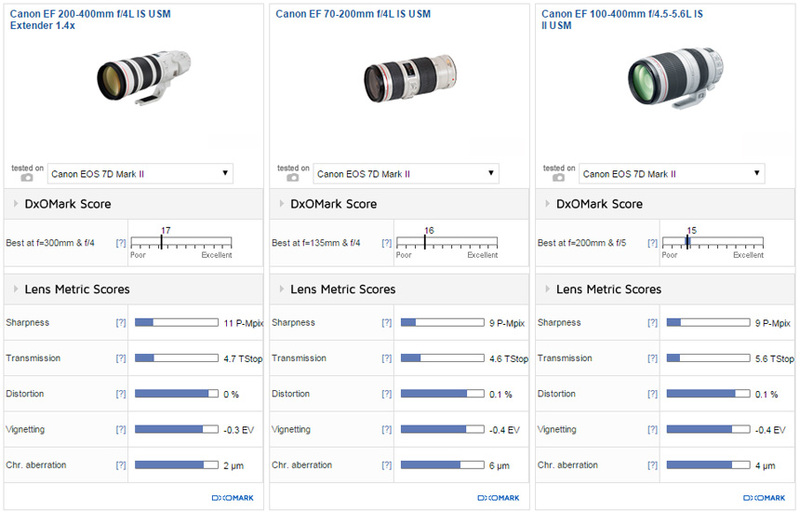 The EF 200-400mm f/4L IS USM wins with an overall DxOMark score of 17 points and earns plaudits for almost all lens metrics. Costing $10,999, it’s the preserve of pros, but if you need a long and flexible focal length, used on the EOS 7D Mark II the equivalent focal length equates to 640mm at f/4 or 896mm at f/5.6 utilising the built-in 1.4x extender. As you’d expect at that price, the EF 200-400mm boasts excellent sharpness at its max aperture at all focal lengths. It’s also pin-sharp at all aperture settings, with the exception of f/32, at which resolution becomes just a little softer. Between the more realistic EF 70-200mm f/4 and the EF 100-400mm f/4-5.6 “pull-zoom” lenses, there’s nothing in it for Distortion, Vignetting, or Chromatic Aberration. The EF 100-400mm has relatively poor light Transmission of 5.6 Tstop, and although the 70-200mm and 200-400mm aren’t great at 4.6 TStop, they’re still a full one stop brighter. The EF 70-200mm isn’t edge-sharp at its maximum f/4 aperture at any focal length, with the best sharpness achieved by closing down to f/5.6. The EF 100-400 is marginally sharper at its maximum aperture, but it’s pretty close, and this lens’s sweet spot for sharpness is at f/5.6 at focal lengths between 200-300mm on the EOS 7D Mark II.